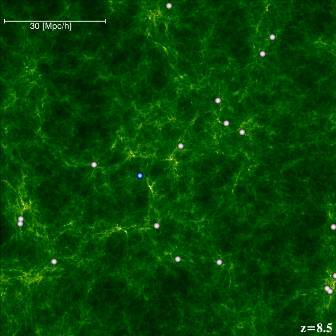 Scientists have used a computer simulation to predict what the very early Universe could have appeared like 500 million years after a big bang. The images, produced by scientists at Durham University’s Institute for Computational Cosmology, show the formation of the first big galaxies in the Universe. Their hypothesis is that galaxies began to form out of the debris of massive stars which died explosively shortly after the beginning of the Universe. The Durham calculation predicts where these galaxies would appear and how they could have evolved to the present day, over 13 billion years later. The researchers hope their findings, which highlight star forming galaxies, will improve their understanding of dark matter — a mysterious substance which most astronomers postulate makes up 80% of the mass in the Universe, and is needed to account for current hypotheses of the creation of the universe, but which no one has yet discovered direct evidence for. The gravity produced by dark matter is an essential ingredient in galaxy formation and by studying its effects the scientists eventually hope to learn more about what the substance is. The research is published in the Monthly Notices of the Royal Astronomical Society  and was funded by the Science and Technology Facilities Council (STFC) and the European Commission. 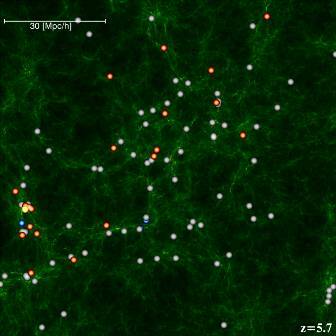 The work combined a massive simulation showing how structures grow in dark matter with a model showing how normal matter, such as gas, behaves to predict how galaxies grow. Gas feels the pull of gravity from dark matter and is heated up before cooling by releasing radiation and turning into stars. 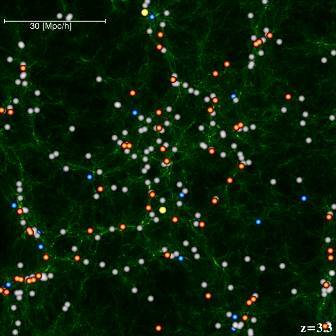 The simulation images show which galaxies are forming stars most vigorously at a given time. Although the galaxies are biggest at the present day, the rate at which they are making new stars has dropped greatly compared with the rate in the early Universe. Lead author, Alvaro Orsi, a research postgraduate in Durham University’s Institute for Computational Cosmology (ICC), said: “We are effectively looking back in time and by doing so we hope to learn how galaxies like our own were made and to understand more about dark matter. 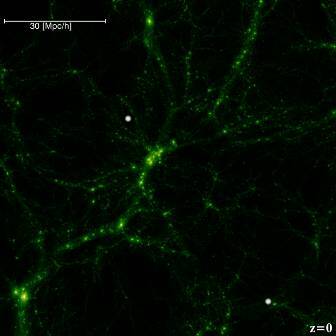 “The presence of dark matter is the key to building galaxies – without dark matter we wouldn’t be here today.” Co-author Dr Carlton Baugh, a Royal Society Research Fellow, in the ICC, at Durham University, said: “Our research predicts which galaxies are growing through the formation of stars at different times in the history of the Universe and how these relate to the dark matter. 1. The clustering of Ly-alpha emitters in a LambdaCDM Universe, Orsi, A, Lacey CG, Baugh, CM, and Infante, L, Monthly Notices of the Royal Astronomical Society, 2008, Volume 391, pages 1589-1604.